Scene setting: The ICU of a hospital. Summary: 4 people with terminal illnesses compete to see who will die first. Type of theater: Absurd tragic-comedy, yet very real, about the perverse delight within society over illness, and the obsession over social security: Does there exist a more pleasurable topic of conversation other than this? : “Well, if I were to tell you what happened to the cousin of my brother-in-law´s wife, who was perfectly peaceful and then, all of a sudden, she felt a pain right here, no big thing, well…anything can happen”? 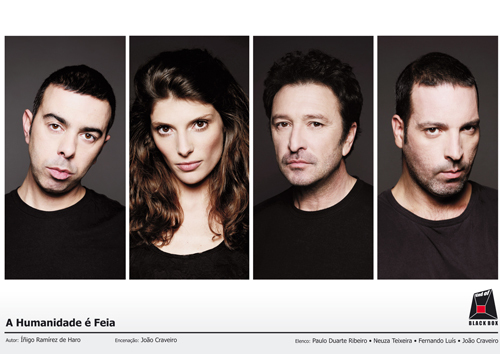 Productions: Opening at the Calor Paredes Auditorio Theater in Lisboa, by the company, “Kind of Black Box” and under the direction of Joao Craveiro. 27 of March, 2011. Subsequent tour throughout Portugal, Brazil and Spain.